Legendary? It goes with saying. Controversial? From the day he first appeared as a soloist, it swirled around him like a hurricane. Actor? Yes. Activist? He was never afraid to speak out. A martyr to hip-hop music and culture? Most definitely. All of these things define the man and the myth of Tupac '2Pac' Shakur, the rapper whose egotistical brashness, charismatic voice and sharp lyrics (ranging from incisive to nihilistic) made him large in life and even larger in death. The 1995 release of "Me Against the World" fell squarely in the middle of all these definitions and a few not even mentioned. The eeriley foreboding thing about this album is that the videos for "Dear Mama" and "Temptations" were both filmed without him, due to his conviction and incarceration on trumped up charges not worth recounting. In a post-mortem world of 'Pac, we've all become sadly familiar with music videos that at best only feature still shots of the slain rapper or outtakes of home videos shot at the studio or in concert. True to his own versatility throughout, Shakur features a different poetic delivery for each track. Alliteration emphasizes the impact of his multi-layered rhymes on "If I Die 2Nite", skips over rhyming when necessary to keep his message thorough on "Young Niggaz", and weaves through the simplicity of the commonly alternating structure of paired couplets to build complexity within "Lord Knows." If any song uncovers the hidden depths of Shakur, surely this one does. While many fans of the late Tupac Shakur treasure every scrap they are fed from his unreleased archives as a gem, they may in fact be overlooking that his greatest works came while he was still alive. 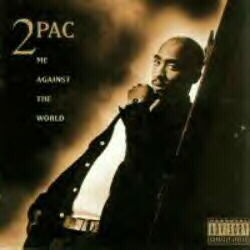 While the post-mortem albums work to preserve a worthy legacy, it is albums such as "Me Against the World" that justify the reason for having such a legacy in the first place. It is fair to say that this is not only the quintessential 2Pac album, but one of the most important rap albums released in the 1990's as a whole. If it's not already part of your collection pick it up POST HASTE.